(MissionNewswire) Salesian Father Luigi Bolla has traveled thousands of kilometers in the Amazon jungle between Peru and Ecuador, often sailing aboard a small boat known as “Pekepeke.” Fr. Bolla first arrived in Peru in 1984 and settled in Kuyuntsa, a city located in the district of Barranca, province of Datem del Marañon, Loreto region. “Yankuam Jintia,” or twilight, is how the Amazon natives refer to the Salesian missionaries who travel from one place to another, walking in the rain and mud of the forest or on the river. Their only vehicle was the small boat capable of carrying only a few people throughout their journey. The Salesians of Peru, who continue the missionary work of Fr. Bolla in that region, with the help of the Don Bosco Foundation of Peru, have succeeded in acquiring a new boat. “The boat we have inaugurated and blessed is called María Auxiliadora and will be destined for long journeys on the river. It is our only means of transport to reach some otherwise inaccessible places in the Amazon,” explains Salesian Father Román Olesinski. 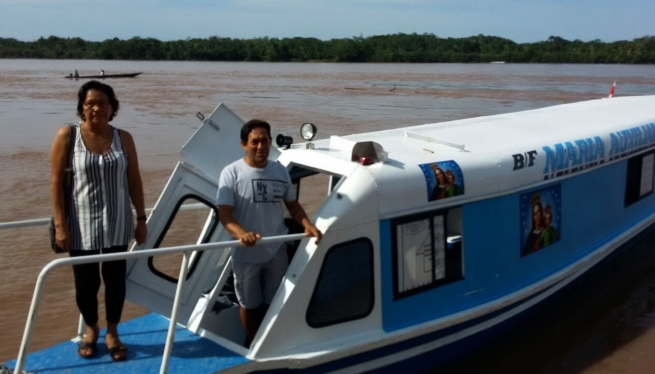 Thanks to the new boat, Salesian missionaries will be able to reach more than 120 communities. These are visits that last for three weeks and are an opportunity to visit schools to meet and educate young people and their families. Salesian missionaries in Peru provide education and social development services for poor youth and their families. Through education and vocational and technical skills training, Salesian missionaries provide youth the opportunity to gain the skills they need to find and retain long-term, stable employment. Missionaries also provide health clinics, feeding programs, shelter and other basic necessities to families in need.